In Creo 4.0 one of the significant enhancements was to provide advanced capabilities for standalone annotations of the following types: Geometric Tolerance (GTOL), Datum Feature Symbol, Datum Target and Dimension. In this blog post, I'll provide a little bit of background to explain the differences (up through Creo 3.0) between standalone annotations and annotation elements owned by an annotation feature. Then I'll explain in more detail the enhancements in Creo 4.0 and I'll finish up with some advice on when you might want to consider using either standalone annotations or annotation elements owned by annotation features. What is a standalone annotation and how is it different from an annotation element inside an annotation feature? A standalone annotation is an annotation that is not "owned" by some other feature in the model. These annotations are listed in the model tree under the Annotations node. Annotation elements, by contrast, are owned by another feature in the model. Typically this feature is an annotation feature, but it can also be general modeling feature (such as Extrude or Hole). Generally speaking, standalone annotations have the same graphical appearance and the same basic properties as annotation elements. For example, the dialog box for configuring a GTOL is identical whether that GTOL is a standalone annotation or an annotation element. Annotation elements can support multiple references of various types (to support the semantic definition of the annotation) and they regenerate at a specific point in the regeneration sequence determined by their owning feature. If something goes wrong during regeneration, annotation elements will provide either a failure or a warning in the Notification Center and the model tree. Annotation elements can have parameters and some types have a number of system parameters that get automatically created for the various properties of the annotation element. Annotation elements may be designated and made visible to Windchill and also identified as a control characteristic and have a Windchill model item that gets passed to MPMLink. For companies moving to Model-Based Definition, these advanced capabilities make annotation elements within annotation features the preferred choice in Creo 3.0 and earlier. The only capability not available to standalone annotations is the ability to support feature operations, which will still only be possible when annotation feature is used. 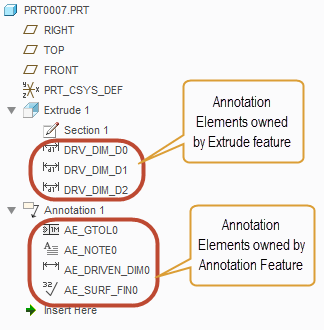 It is important to note that these advanced capabilities are only available in Creo 4.0 for the standalone annotations of the four types noted above. Other types of standalone annotations (such as Notes, Symbols, Surface Finish Symbols) do NOT have these advanced capabilities and the standalone annotations of these types will behave as they currently do in Creo 3.0. We plan to provide the advanced capabilities for these remaining annotation types in Creo 5.0. Given that most of the advanced capabilities of annotation elements will be available with standalone annotations (for GTOL, Datum Feature Symbol, Datum Target and Dimension), there is less of a need to use annotation features in Creo 4.0. Here are some criteria that can help you decide which method to use. Standalone annotations appear in the model tree under the Annotations node at the top. They are presented in a flat list grouped by type. If the model contains a large number of annotations, it might become a little hard to manage such a long list of annotations in Creo 4.0. Using annotation features would allow you to group and structure the annotations in the tree. Besides the three reasons above there generally aren't any other advantages to using annotation elements over the enhanced standalone annotations. Most importantly, you can capture the full semantic definition while using the enhanced standalone annotations and it is this ability to define fully semantic GD&T that many companies are considering the major benefit to a Model-Based Definition. Moved this blog from Creo Sneak Peek group to the Model Based Enterprise group. Thanks you for this clear explanation. I was one of the first to have to start using MBD in a company I am contracting with, without any prior training, and have been using standalone annotations exclusively. Some other users in our company use the Annotation Features and Elements and I was struggling to understand why. After some Q&A with PTC reps, I understood these AE and AF to be phased out in the future, so thought I was on the right path, but was suprised when the company published a MBD standard that relies very heavily on AE and AF. One of my biggest struggles was in annotating part level features at a "next assembly" level (for an overmolded subassembly). I had to show the annotation in the .prt file first so that they were accessible to show in the sub-assembly. I use model/driving dimensions only. If I didn't like the placement in the assembly file's annotations, I had to adjust them in the .prt file. Very cumbersome. I wonder if this behavior is easier with AE? I'm glad you found this post useful. Annotation Features are not planned to be phased out at any time in the future. As noted in the post above, AF's have some distinct capabilities that are not available with standalone annotations (even the newly enhanced ones in Creo 4.0). Most companies are using AF as part of their MBD standards because of the ability to define additional semantic references, which is just not available for standalone annotations in Creo 3.0 and earlier, so it's no surprise to me that the company you're working with had that in their standard. Similarly, adjustments to the position of annotations can still only be made at the part level in Creo 4.0. We might also look at making some changes to this in Creo 5.0 as well. I had one particular case when standalone annotations are better than annotations features. i wanted to use combined views with annotations features to automate some specific drawings creation in my enterprise. When one of the annotations Inside the parent annotation feature loses her referencse, the annotation feature turns red and it fails. Which conduct in the drawing we lose visibility of all the other annotations Inside the parent annotations feature. In this case if i use standalone annotations, only the failed one will disappear in the drawing. One of the disadvantage of annotation features is that when you lose references the lost annotations dont turn purple like the old dimension created directly in the drawing mode. It this planned in futur Creo versions? When references are lost, annotations or Gtol turning purple either Inside the 3Dmodel or Drawing mode? same functioning than the dimensions created in drawing. Hi Debbie, can you swing a link to your MBD standard to me via the GE internal email (-). We in GEHC are toe dipping with MBD and right now for sure we've made the advice too dam hard/slow. I'm wanting to champion something a little more balanced in the coming months. What is your logic with forcing yourself to only use model/driving dimensions btw? You'd hate it here LOL we advise keeping model dims for model changing and created dimensions for the manufacturing scheme. 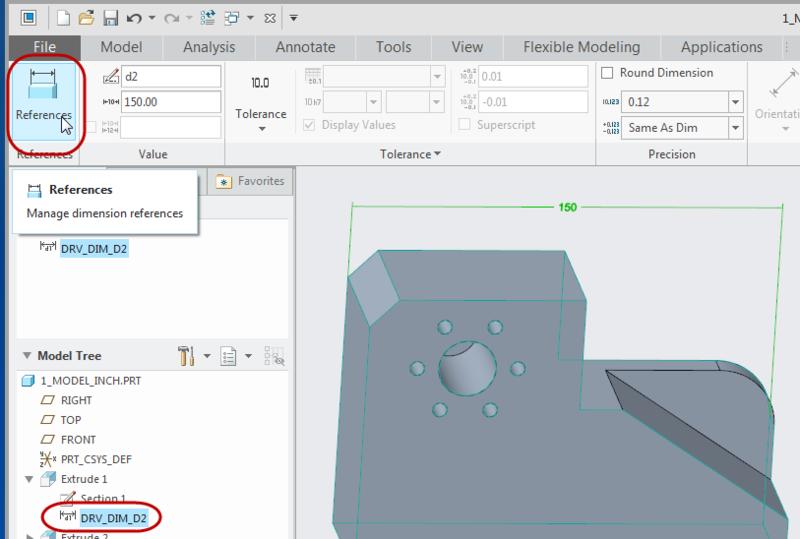 Hi Raphael, is possible add to a text note in annotation feature, or stand alone, in Creo2 Parametric assembly? How to add and correcct show in Creo View with Windhcill? Please send me a datasheet guide. Thanks! In any case, annotation features in Creo 4.0 will still continue to behave the same way as Creo 3.0 with regard to failure if one of the annotation has a missing reference. Yes, it is possible to create a note in an assembly in Creo 2.0. It can be done either as a standalone annotation using the command in the Ribbon or from within an Annotation Feature using the command in the Annotation Feature dialog. I believe to get the notes to publish to Creo View, you'll need to edit the recipe file for the Creo View adapter to ensure that the publishing of notes is turned on. Thanks for your feedback and explanations. Thanks for that summary of changes to functionality in Creo 4. I've been using annotation functionality in PTC's CAD system since Wildfire 1. I'm disappointed that improvements to the functionality are so slow in coming. Rather than having a single set of MBD functionality, Creo continues to have 4 generations of functionality, each with significant differences in interface, functionality and user interaction. As you see from at least one of the comments, this is a constant source of confusion for those who want to annotate models. The functionality for annotating assemblies is very cumbersome, as noted by another user above. That gives rise to two basic strategies for doing so. The first, what I refer to as the "Las Vegas strategy" is that "what happens in parts stays in parts. No 3D annotations are re-used at an assembly level. This is advisable due to the cumbersomeness of dealing with part shown dimensions (Driving Dimension Annotation Elements) at an assembly level and the "random" functionality of using the other types of annotations at a part level to be viewed at the assembly level. The outcome of this approach is that all annotations that appear in an assembly are created in that assembly: zero re-use of part-level annotations. The second strategy is a "multi-level" strategy in which part-level annotations are visible at an assembly level. This approach is very cumbersome due to "holes" in functionality that follow no particular logic - some things you can do, some you can't. It has been, in my experience the hard way of accomplishing annotation of assemblies. With the limitations of the types of annotations that can be shown (Driving Dimension Annotation Elements), as well as what can be done with them, particularly in terms of managing and organizing them, any potential advantages of using shown dimensions are offset by the difficulty in managing them, but in very simple models. Even if "shown" annotations are used, notes, symbols, etc. still must be created using one of the other sets (generations) of functionality, forcing the user to use different interfaces, with different functionalities to accomplish the task of annotating the model. The most "complete" of the functionality is found in the Annotation Features. 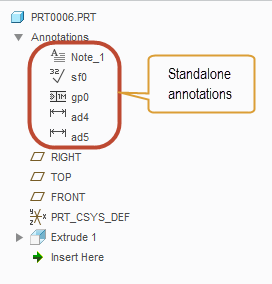 As you have described, some of that functionality has now been added to Standalone Annotations in Creo 4, but only for the four types of annotations elements you mention. The practical result is that the best approach to using the annotation functionality in Creo is to use Annotation Features, particularly in a large organization with users of varying skill and experience levels. This provides, as much as possible, a unified set of functionality, user interface and user interaction. It also allows users to organize and manage those annotations in ways that Standalone Annotations and Driving Dimension Annotation Elements do not, which is critical in a large organization where a single model is often used by many people, beyond the person who originally created the model. Last, I find it very odd that the very thing for which one would want to use Creo View to view - the 3D annotations - is not "published" by Creo Parametric by default. That one must go through a complex "off-line" configuration of Creo View to publish annotations is a serious limitation of the interface between Creo Parametric and Creo View. It should "just work". It doesn't. While I appreciate PTC (slowly) adding functionality to the 3D annotation capabilities, in my opinion and experience, PTC really needs to re-think its entire approach to a model-based definition, specifically the annotation functionality it provides. Mostly, what we are seeing in Creo Parametric 1, 2, 3 and 4 are band aids to prop up poorly conceived functionality. Standalone Annotations, for example, go back to the earliest versions of Pro/ENGINEER, with only relatively minor changes to the functionality in all this time. Thanks for the feedback. I agree that it would be nice if everything related to MBD were unified and consistent, but unfortunately that's not the case right now and we kind of need to play the hand we've been dealt. As you noted, there is a fair amount of history here and I think it's probably not a stretch to say that MBD has historically been a lower priority relative to the other areas of Creo and there hasn't been much a strategic focus until recently. The good news is that MBD is now getting some strategic focus as evidenced by the sheer volume of improvements that have come in Creo 4.0. As a result, we are indeed approaching the MBD capabilities within Creo Parametric in a more holistic sense. In other words, there is a long-term vision for having a unified and consistent experience for the user (both within the MBD tools and between MBD and Detailing where appropriate - you'll notice that the UI and workflow is identical between 2D and 3D for the annotations we enhanced in Creo 4.0). There are constraints that we have to deal with often we have to make decisions such as enhancing 4 types of annotations (GTOL, Dimension, Datum Feature Symbol, Datum Target) in one release while leaving the remaining annotation types untouched (Notes, Symbols, Surface Finish) until we can enhance them in a similar fashion in a future release. There are essentially two ways in which we could do this. The first way is to work on the improvements across the board and not expose any of those changes to customers until all of it is complete. Essentially we would be working on upgrading all of the annotations during the Creo 4.0 cycle, but all of it would remain hidden until Creo 5.0 or Creo 6.0 when everything was done. The other way to do it (and the way we chose to do it) is to decide on some subset of the entire package that would offer meaningful improvements to the user base and ship that subset in the nearest release while we continue to work on the remaining parts until they are complete so we can ship them in a future release. I think there is a lot of merit to the second approach, which is why we went that way. The question essentially boils down to whether the new enhancements offer enough benefits to outweigh the inconsistency that would result from this staged approach. So, as I said, we do have a unified, consistent vision and are working toward that. It's just that it'll take some time to get there. Is it possible to add a driving dimension (technically, considered an AE) to an AF, in order to and have better control of which surfaces are included in that dimension, and are highlighted when that dimension is selected? The one caveat was that all surfaces on the plane highlighted, and sometimes there are surfaces on a common plane for which a tighter tolerance should be held on only one of those surfaces, so highlighting all the surfaces on that plane can be misleading and costly. I was trying to figure out how to add the model dimension to an AF, in hopes that I could better control which surfaces are associated to that dimension, but wasn't able to select driving dimensions (even though they are Annotation Elements). So, to re-state my question....if driving (model) dimensions are considered Annotation Elements, can I add them to the AF such that I can have better communication with the viewer? I am using CREO 3.0, M110. The short answer is, "No". Driving Dimensions are not Annotation Elements: driving dimensions are driving dimensions. A Driving Dimension Annotation Element is an associative, dependent copy of a driving dimension. Why create a copy of a driving dimension? Driving dimensions, in the 3D environment, are visible only when the feature to which the driving dimension belongs is being edited or redefined. An Annotation Element can, if desired, be visible at any time, even when a feature is not being edited or redefined: annotations are for the purposes of communicating information about a design/model, whereas driving dimensions are the means of controlling the size, shape and position of elements of a design/model. Driving Dimension Annotation Elements have a variety of functional limitations. One of their limitations is that they use the same references as the original driving dimension of which it is a copy. For example, if you have a pattern of identical holes, all of the same size, it is not possible to have a Driving Dimension Annotation Element that references all of the identical holes. Instead, when you select the Driving Dimension Annotation Element, only the one edge or surface of the one hole that contains the driving dimension will highlight. Similarly, in the situation you describe, you cannot change the references used by the Annotation Element that is a copy of the driving dimension: the copied Annotation only uses the same references as the driving dimension of which it is a copy. Another limitation of Driving Dimension Annotation Elements is that they cannot be included in Annotation Features: two different sets of functionality with very different behaviors and interfaces. Driving Dimension Annotation Elements are of sufficiently limited functionality that, but for the simplest of models, It's my recommendation that they not be used. This goes against 30 years of "conventional" wisdom of always using "shown" dimensions on drawings. Thanks for your response, Charles. But, I do see your point about the limited functionality, and see why they are limiting in many ways. In the hole example, instead of having the surfaces highlight, I would still use the drafting standard method, where the dimension itself calls out the number of holes at that size (2X holesize). I had a case where a part was family tabled, and the number of features in a hole pattern varied between part instances, and the note kept up with that information when I made the note reference the number of occurrences in the pattern. I see pros and cons to everything, and am just trying to understand the most robust way to forge ahead into MBD without losing the wisdom of conventional practices, especially for those viewers and especially our vendors, who may still prefer a hard copy with 2D-straight on views. It's not only hard on us experienced users who are used to functional, model driven information, it's a gradual re-training of our "audience". It'll be interesting to see how things are a few years from now. That's a great explanation, Charles, the only comment that I would make is that I prefer to say that the DDAE (Driving Dimension Annotation Element) acts more like a "wrapper" on top of the underlying feature dimension rather than calling it a "copy". There is still only the one dimension in the database, it's just that it carries some additional cosmetic attributes once it is converted to DDAE. Everything else you said is spot-on! In Creo 4.0 we now offer the capability to manually add semantic references for Driving Dimension Annotation Elements (DDAE). 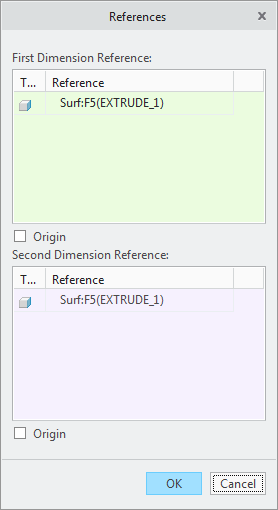 There is an issue with F000 where it seems these surfaces aren't highlighting when the dimension is selected, but the references are there nonetheless and will be passed on to any downstream software that wants to use the semantic references. We will be fixing the highlight issue in an upcoming MOR. Good to know- thanks for sharing. I guess I don't need to totally abandon the use of Model /Driving Dims, then......time will tell, I suppose. Another short question regarding MBD, if the aim is to clearly abandon drawing creation and move the definition of a component from the 2d drawing to 3d part with annotations. There is still to this date a problem when defining tables in the 3d. Ok we can retrieve any part/feature parameter in a 3d table by using the syntaxe "&name_of_parameter". But if i understand right, not all parameters available in drawings repeat regions are always available as assembly/part selectable parameters. At one point, it is planned in future to make all these repeat regions parameters available for selection so we can include them in 3d tables? or maybe add repeat region themselves as features in 3d mode? We do have a roadmap for offering tables as a 3D annotation. Whether these tables will support repeat regions as in 2D today is not decided. At a minimum, we would like to provide simple tables where you can enter text or add callouts to parameters. We're exploring some options of providing the information normally included in repeat region tables, but perhaps presenting it differently than as a table in the graphics window along with the model geometry. It's too soon to say right now what exactly that would look like, but we're working on it. Im sorry when i write "3d table" i mean by that a 3d symbol looking like a table and containing parameters with syntaxe "&name_of_parameter". Ok thanks for the explanations and quick feedback. "Knowing how 2D views are frowned upon in MBD"
Can anyone clarify whether or not this is true in the MBD culture? Our implementation of MBD commonly makes use of orthographic (2D) views. The strength of orthographic views is that they most often represent the true size and shape of a feature. Ortho views, along with the ability to rotate a model, seems to me to offer the most complete communication about a design. 3D/Iso views can be just as powerful when communicating certain aspects of a design. I would not think it healthy to discourage either type of view. Great question! I look forward to the PTC response to this, as I have been a little scorned for having my MBD views in orthographic orientations. I find that the best approach myself, because the viewer can rotate it, but still return to a straight on view. It's really difficult to read the dimensions when the model is rotated and the dimensions are assigned to a specific plane, so are not flat to screen.. I'm trying to modernize my communications, but there are very good arguments in favor of 2D views, and I'm glad I'm not alone in this belief. That summarizes it. Where I work, part and assembly templates have been setup to use a series of standard 2D views: it is what people are most used to and is a good place to start for those new to a model-based approach. I encourage users to use 3D views if that improves communication or simplifies the annotation process. One can mix and match 2D views with 3D views to achieve the best result. You wrote "we advise keeping model dims for model changing and created dimensions for the manufacturing scheme." Does this mean there can be a discrepancy between the driving dimensions used to create the model and the created dimensions used for manufacturing ? Is this hindering automated generation of tool paths ? I only have a basic understanding of what MBD is all about so my apologies if any of my following remarks/comments are too stupid. As I understand so far the benefit of MBD is that there is one file of a design (part, assembly) that needs to be maintained. This file contains the 3D model annotated with all the necessary GD&T and dimensional tolerances. The benefit of this is that PDM systems only need to take care of one file (instead of a file for the design, a file for the drawing, ...). This eliminates the danger of using a drawing file that is not on par with the latest version of the design. By supporting an exchange format like STEP-AP242 it is easy to exchange this annotated 3D model with other stakeholders (quality control, ...). The use of correct applied semantic references for 3D annotations should make it possible to process them in other computer programs. I think the only programs that at this time are capable of doing something useful with this information are software packages that generate programs for measuring machines. As I'm mainly involved in production (generating toolpaths for CNC machines) I'm wondering how I can use this information in the PTC manufacturing modules. As there can e.g. (amongst a lot of other problems) be a discrepancy between the driving dimensions and the dimensions specified with annotation features (which can result in different dimensional tolerances) I'm wondering what is the preferred method to deal with these differences. Until now I had to create several models in which I changed the driving dimensions in order to get them correspond to the required tolerances in order to generate the correct toolpaths. For sure this can't be the right way as this makes things extremely hard to manage for manufacture and makes it impossible to have some kind of concurrent engineering philosophy.